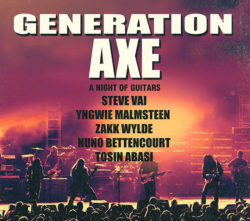 Steve Vai, Zakk Wylde, Yngwie Malmsteen, Nuno Bettencourt & Tosin Abasi to Stage Second Generation Axe Tour. 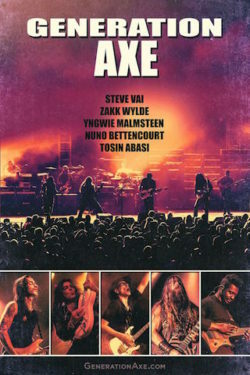 Los Angeles, CA — The term “supergroup” gets thrown around on a regular basis these days, however, GENERATION AXE undisputedly brings together some of the greatest guitarists of all time. Steve Vai, Zakk Wylde, Yngwie Malmsteen, Nuno Bettencourt, and Tosin Abisi once again will join together to tour North America to stage 32 appearances across the country. Beginning on November 7 at the Fox Theater in Oakland, CA, the run will return to markets where the inaugural tour was celebrated and hit several new cities for the first time. The general on-sale goes live July 13. John 5 is probably best known for his work with Marilyn Manson and Rob Zombie however he is also a successful solo artist who recently released his 8th solo album titled “Careful with That Axe”. The album blends a multitude of styles and sounds making the album impossible to ignore. Media Mikes spoke with John recently about the album creation, his backing band The Creatures and what fans can expect from his first ever solo tour. Adam Lawton: What can you tell us about your latest solo album? John 5: The latest album is titled “Careful with that Axe”. The album was recorded live so there are no punch ins or anything like that. I had an amazing band which consisted of Rodger Carter on drums and Matt Bissonnette on bass. Everything just went together real well which led to the idea of taking things out on the road. The songs all sounded really great and Rob was going to be working on a movie so the timing also worked out. The album has everything from western swing guitar to Spanish style guitar. There are also a couple Jerry Reed songs on there as well. This is really my favorite record from the ones I have done. AL: What made you decide to cover some of Jerry Reed’s material? J5: Everything is from childhood. Jerry Reed was someone whose music was always being played in my house. My father loved “Hee Haw” and was into guys like Chet Atkins and Jerry. One of my favorite pickers is Jerry Reed so I wanted to pay a little tribute to him and maybe educate a few people along the way about who he was. AL: What type steps did you take during pre-production to ensure you could record each song live? J5: I would sit with a metronome and really work at the songs to get them as tight as I possibly could on my own. I would then go in and rehearse with the guys. It was sort of like training for a fight as after those rehearsals we would go in and record it. It only took a couple hours for each song and then I would go back and mix things. It was a pretty fast recording process however preparing and getting to that point took some time. It was a challenge doing things the way we did but it I like that and it was a lot of fun. AL: Can you give us some info on the upcoming tour? J5: This will actually be my very first solo tour. This is a tour that is going to be very special for me. For the fans we are doing a special meet and greet package where people who purchase these will get to come to sound check and meet the band along with all the standard photos and such. You also get the super rare John 5 soda. People have been driving hundreds of miles for this stuff! We are going to be everywhere with this tour and I am very excited to get out there. We also have plans to record a live album during this tour which should be a lot of fun as well. AL: Are you going to have the same backing band that played on the album out on the road with you? J5: Rodger Carter will be on drums. I have known him for quite awhile and he is just a really great player. However Matt will not be out with us due to his commitments with Elton John. To find a replacement I had to go to the Musicians Institute to find someone who could play this material. I found a guy buy the name of Ian Ross who is just a monster. This band is just phenomenal. AL: Are there plans to change any of the song arrangements for the live shows? J5: They will pretty much have the same formula. When I would go see bands and they wouldn’t play songs the way they were on the albums it sort of bummed me out. I loved going to see bands like Rush that played exactly what you heard on the record. I just found that so cool. I tend to take that same approach and keep things pretty close to the records. AL: You also have a new live album with Rob Zombie coming out. Can you tell us about that? J5: This album is a completely live album. There are no overdubs what so ever. We captured the material over a couple different shows. This record really shows just how tight of a band we are. I am very proud of that fact. Rob has done an amazing job and this album came out really great. I personally enjoy live albums especially ones like that this that are true live albums. You can go back and listen to that live performance time and time again. AL: What other projects do you have in the works for this year? J5: We just finished work on a new Rob Zombie album. I’m not sure when it’s going to be out just yet however it’s probably one of the best Zombie albums to date. I was a big Zombie fan even before I was in the band and I feel this new album is the best one by far. I also will be working with Rob on the score for his next film “31”. Another thing I have out is a new set of signature guitar strings which are being put out by Dean Markley. I have used their strings since I was a kid so to have my own signature set is pretty cool. “Careful with That Axe” is the latest solo release from guitarist John 5. The 9th solo release from the former Marilyn Manson guitarist and current Rob Zombie guitarist the 10 track instrumental album covers immense musical ground as 5 and his cohorts are unleashed on your ears like bees exploding out of a freshly broken hive. Tracks like the albums opener “We Need to Talk about John” feature Zombie like overdubs which gives the album a familiar feel right off the bat while the guitar virtuoso meticulous shreds in the back ground making you well aware of what you are in for with the following 9 tracks. The album quickly gives way to a diverse make up of material like the rockabilly tinged “Six Hundred and Sixty Six Pickers in Hell” and the in your face “Flight of the Vulcan Kelly” before traversing to the flamenco like styling’s of “El Cucuy” and the hauntingly down tuned “Portrait of Sidney Sloan”. Combine all that with two signature Jerry Reed songs “Jerry’s Breakdown” and “Jiffy Jam” which showcase John 5’s impressive picking skills and you have a very unique listen. You don’t have to be a guitarist to enjoy the over the top instrumentation, eerie overdubs and/or crunching heavy metal rhythms as John 5’s “Careful with That Axe” speaks to everyone. The only downfall I could find worth noting with this release was that there were only 10 tracks as John 5 and company left me wanting more.